Today, four days before the election, Paul Ryan told a crowd assembled on an airport tarmac that he could "smell success." And the crowd roared. The smell, in fact, was that of cow manure, or something that smelled an awful lot like it. The tarmac is nestled in the mountains here, and as it became more and more overpowering, and as Ryan was more and more intently describing his running mate's business credentials, the VP contender paused, took a deep whiff and said, "I can smell success right now. "That's the smell of success isn't it? That's the smell of progress. I love that smell, it makes me feel at home," Ryan said. Gov. Christie has ordered gas rationing in 12 counties. Will it affect voter turnout in the state? The WSJ reports on voting hurdles in the tri-state area affected by Sandy. In the Medicare arena, the choice is between a Democratic approach that wants to retain Medicare as a guaranteed set of benefits with the government paying its share of the costs even if costs rise, and a Republican approach that wants to limit the government’s spending to a defined level, relying on untested market forces to drive down insurance costs. 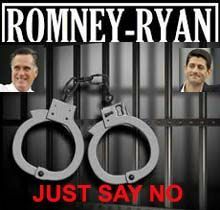 Mitt Romney and Paul Ryan today said they want to overhaul Medicaid and food stamps. Here are the statistics on hunger in America. One of the most common misconceptions is the assumption that if someone is hungry, that means they do not have a job and are living on the streets. What most people don’t understand is that anyone can experience hunger. It is a silent epidemic that affects 49 million Americans. According to the US Census Bureau, in 2010, 21 million people lived in working-poor families. This translates into nearly 9.6 percent of all American families living below 100 percent of poverty have at least one family member working . In fact, 36 percent of client households served by the Feeding America network have one or more adults working. 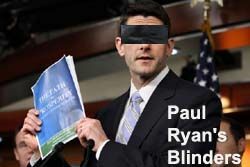 Robert Greenstein, President of the Center on Budget and Policy Priorities, called Ryan's plan "Robin Hood in reverse, on steroids." A New York Times editorial today calls Paul Ryan a "man of cramped vision." A candidate [Mitt Romney]of no details — I’ll cut the budget but no need to explain just how — has named a vice-presidential running mate, Paul Ryan, whose vision is filled with endless columns of minus signs. Voters will now be able to see with painful clarity just what the Republican Party has in store for them.